In complex macromolecules, minor modifications can generate major changes, due to self-assembling capacities of macromolecular or supramolecular networks. Controlled Drug Delivery highlights how the multifunctionality of several materials can be achieved and valorized for pharmaceutical and biopharmaceutical applications. 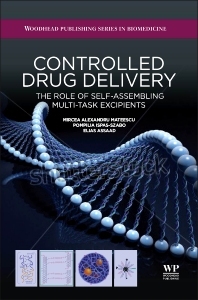 Topics covered in this comprehensive book include: the concept of self-assembling; starch and derivatives as pharmaceutical excipients; and chitosan and derivatives as biomaterials and as pharmaceutical excipients. Later chapters discuss polyelectrolyte complexes as excipients for oral administration; and natural semi-synthetic and synthetic materials. Closing chapters cover protein-protein associative interactions and their involvement in bioformulations; self-assembling materials, implants and xenografts; and provide conclusions and perspectives. Mircea Alexandru Mateescu is Professor of Biochemistry, Université du Québec à Montréal, Canada, and is a scientist with expertise in drug delivery systems and biochemical pharmacology. He is inventor of several novel biomaterials with particular characteristics related to supramolecular self-assembling phenomena and promoter of new technologies in pharmaceutical formulations. With more than 125 articles published in refereed specialty journals and 27 Patents, he is leading a large laboratory team. Mateescu is the holder of the J-A. Bombardier ACFAS Prize for Technological Innovation in Canada. Pompilia Ispas-Szabo is adjunct professor at Université du Québec à Montreal and Research & Development scientist in pharmaceutical industry. Her expertise relates to material science, formulation and characterization of drug delivery systems. With more than eighteen years’ experience in the pharmaceutical field, Ispas-Szabo was deeply involved in the concept of novel polymeric excipients, drug delivery platforms and development of new products. Elias Assaad is Research Associate at the University of Québec à Montréal, and has extensive experience in pharmaceutical research, particularly in the design of polymeric excipients for controlled drug delivery and in the conception of polyelectrolyte complexes. He is also skilled in the characterization of excipients for drug delivery systems.